Karauli is a famous district in the state of Rajasthan. 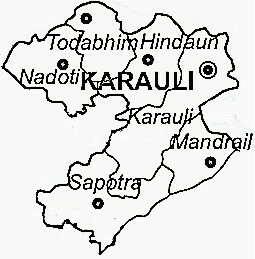 The headquarters of the district is located in the town of Karauli. Karauli is known as the commercial hub and numerous industries are situated here.Karauli district previously known as Kalyanpuri due to a famous local deity Kalyanji. The presence of more than 300 temples in Karauli makes it one of the holiest places of Rajasthan. Pale red-stone architecture and boasts of various magnificent monuments are one of the main attraction of Karauli. Karauli district is located at a distance of 160 km from Jaipur. It has border with Dholpur District in the east; with Bharatpur District in the north-east; with Dausa District in the north; and with Sawai Madhopur District in the west. Karauli enjoys extreme climates in summers as well as winters. Temperature reach maximum 47 C in summers and dips to minimum 4 C in winters. Rainfall during monsoon is also medium. Nearest to Karauli, the main railway station is Gangapur, which is 81 km away from Karauli. Karauli has Sanganer Airport, Jaipur as its nearest airport which is at a distance of 160 km. There are regular buses from Gangapur and Jaipur to Karauli.